This Cuisinart machine is like the BMW of pre-frozen ice cream makers. and that statement is as true as it is ridiculous. Though it’s one of the most expensive pre-frozen bowl models market, the premium price really does earn you premium quality. Boasting reliable parts, a much improved turning mechanism, an excellent look, and a whopping 5 year warranty, this is the ice cream machine for true ice cream fans. 2 litre bowl – the largest size of any pre-frozen bowl ice cream maker. High quality finish – no cheap plastic in sight. 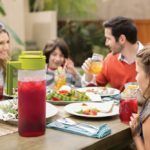 Open lid – allowing plenty of air, taste samples, and easy ingredient adding. 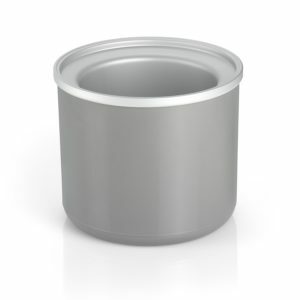 Gel-insulated bowl – Keeping the mixture colder for longer – allowing for faster mixing and higher quality ice cream. 5 year guarantee – more than double every other ice cream maker of it’s type. Quality detachable parts – easy to clean equipment that guarantees consistent mixing. 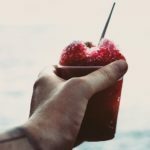 Expensive – top price of the pre-frozen bowl market. Relatively loud – due to turning the bowl instead of the mixing arm (which prevents the whole mix sticking together). Longer freeze time – a recommended minimum of 12 hours (to allow proper freezing of the insulating gel). Storage/freezer space – due to the larger bowl. It’s the most expensive pre-frozen bowl ice cream maker out there on the market.. but that’s for good reason. While most other homemade ice cream machines focus on being as cheap as possible – Cuisinart have stuck to producing the high quality product that they’re known for. Don’t just take our word for it. The machine comes with a full 5 year warranty, which is a massive step up from the 1-2 year warranties you’ll find on every other ice cream maker. It’s a statement that exudes confidence in the reliability of the product. This Cuisinart model is the only pre-frozen bowl ice cream maker that isn’t made out of the standard cheap plastic that’s so common on almost every budget appliance nowadays. 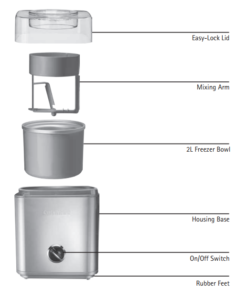 While the other options will look like any old cheap appliance, the stainless steel finish on the Cuisinart ICE30 will make it perfectly at home in any modern kitchen. You can actually see the ice cream being made. This makes it so much easier to base the total mixing time on how the mixture is actually doing, rather than setting a timer and crossing your fingers. Much more air can flow into the mix. As covered in our ice cream making tips, proper air incorporation is the key to a light and fluffy ice cream. Incredibly easy to add ingredients. Never underestimate the benefit of less mess! Especially if you’ve got pairs of small and eager hands helping you out. You can sample the ice cream as it’s being mixed. Definitely a case of last but not least, every aspiring chef worth their salt knows that tasting as you go is the key to ensuring the success of any recipe. Dipping a small spoon inside can tell you everything from how the taste combination of your ingredients is turning out, to having a real gauge for the ice cream consistency. The large bowl and unique mixing arm are what sets this model apart from the competition..
Now that we’ve covered the lid, let’s look at what’s inside the machine. Rather than a standard ‘paddle’ mixing arm that rotates, the housing base of the machine instead rotates the actual freezer bowl. This means that the ice cream can’t end up getting stuck in one piece to the rotating arms. Instead, it’s forced to push itself through the mixing arm, which ensures a continuous mix that isn’t going to get stuck together as one big lump. So far, this is the only pre-frozen bowl machine we’ve found that mixes the ice cream in this way, and so it’s a big point to consider when comparing it to the cheaper counterparts. While they can give you great ice cream, it’s quite possible that the rotating paddles they use will collect big blocks of ice cream mixture, leaving you with undesirable patches of solid cream. While that may not sound like the end of the world, waiting for the bowl to reach the proper freezer temperature again can take hours; potentially ruining any plans you had (not good if there’s kids who’ve been promised ice cream!). In the end, sometimes it really is better to fork out the extra cash and pay for a product that won’t waste your time, and the Cuisinart ICE30 is the perfect example of that step up in quality. While this different method of mixing does make for a better ice cream mix, it does create a bit more noise. We believe it’s because of the extra power required to turn the whole bowl (rather than just the arm), but don’t worry.. it’ll all be worth it once you’re sitting there with some incredible homemade ice cream in hand. If the machine’s too noisy, remember that it doesn’t have to be in your kitchen. For the duration of mixing, you can put it anywhere that has a plug socket – just remember to set a reminder to check it! The large bowl for plenty of homemade ice cream. First, make sure you’ve got the freezer capacity to store it without making things stressful on you. It’s a full 20cm in diameter, and 16cm high. Something along the lines of a small Amazon delivery box. Remember that you’ll need to fit this guy in your freezer for around 12 hours if you want the best possible results, so it’s not like you can just take out those old leftovers that have been in there for far too long and hope to replace them. Never store your ice cream mix in the bowl after mixing. With a large bowl like this, it will be tempting to let your mixture finish setting in the bowl for later. However, this can damage the inner-coating of your precious bowl. Make sure you’ve got some containers handy to transfer your delicious masterpiece to. Keep in mind that a 2 litre bowl doesn’t mean filling it with 2 litres of ice cream mix. Unless your a fan of ice cream that doesn’t have air inside it ( in which case, it may as well just be a block of frozen cream ), then make sure to fill it with a maximum of 1.5 litres. This allows plenty of space for the air to get mixed in and give you that smooth fluffy texture. Finally, make sure to stick to all of our recommended tips and tricks (full guide coming soon) in order to make the most out of your Cuisinart ice cream maker. Most important is to make sure both your bowl and ingredients are chilled properly, both of which are greatly helped by the insulation gel in this Cuisinart bowl. Let’s wrap things up. Is it worth your money? With the Cuisinart ICE30, we have the age old problem. Do you save some money and grab a cheap ice cream maker, or fork out the extra cash for this better model? Most of all, we truly believe that the easier a machine is to use – the more you’ll use it. There’s always a big risk with purchasing appliances like this where the effort required will soon make the whole process too irritating to keep doing in the future – you don’t want to end up just settling back to buying a pack of pre-made ice cream. With a machine like this Cuisinart, the whole ice cream making process is that much more enjoyable. 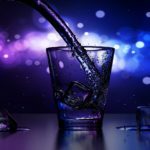 With it, there’ll be a much higher chance of you getting some real use out of it, rather than just on a few occasions for the novelty of it all. 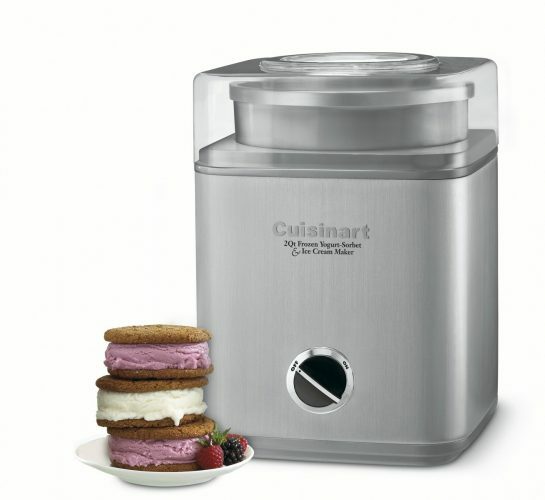 Check out the Cuisinart model on Amazon, and start making your ice cream dreams come true. Here’s a great video demonstration by Maureen Dennis from weewelcome.ca on how easy it is to use the Cuisinart ICE30 – even with plenty of little hands wanting to help!